Play-Doh Cupcake Celebration Playset Just $10.72! Down From $20! You are here: Home / Great Deals / Play-Doh Cupcake Celebration Playset Just $10.72! Down From $20! Right now you can get this Play-Doh Cupcake Celebration Playset for just $10.97 (Reg. $20) at Walmart! 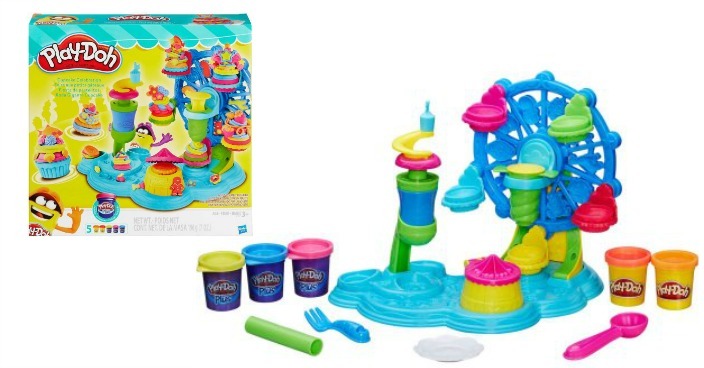 Get the whirly, twirly fun started with the Play-Doh Cupcake Celebration Playset. Kids and adults alike will enjoy the many fun projects they can work on and build with this exciting new toy. Give your cupcake playset bakery creations a sweet ride on the crazy Ferris wheel. Then your child can stop at the bottom and squeeze a dollop of frosting on top. Next, pop some pretend cupcakes under the sprinkle crank to shower them in colorful sprinkles. You can also create colorful pretend cookies, imaginary animal crackers and make-believe candies to complete your Play-Doh playset dessert extravaganza. This makes for a great birthday present or a neat gift come holiday time. The unique circus tent doubles as a cookie mold so you can easily create some added fun. There are also lots of half-molds to create fun toppings. Play-Doh and all related properties are trademarks of Hasbro. Each of your creations is fun to play with but not to eat. Shape some colorful pretend miniature cakes and give them a sweet ride with the Play-Doh Cupcake Celebration Playset.